Cal hiring Justin Wilson as its new head coach looks like a good decision. Though the 2017 college football campaign feels like it just started, we’re already one quarter of the way through the regular season. Four weeks in, some fan bases are already wondering what happened. Earlier this week, we covered the five most disappointing teams so far. But there’s another side to that with fans that are feeling hope and excitement over their team’s performance to this point. Here, we take the “glass half full” approach and look at the five teams that have surprised us the most (in a good way) so far this season. It was expected that the Aztecs would be the best team in the West division of the Mountain West. What wasn’t expected was that San Diego State would be 2-0 against Pac-12 opponents with a win at Arizona State and one at home against Stanford. 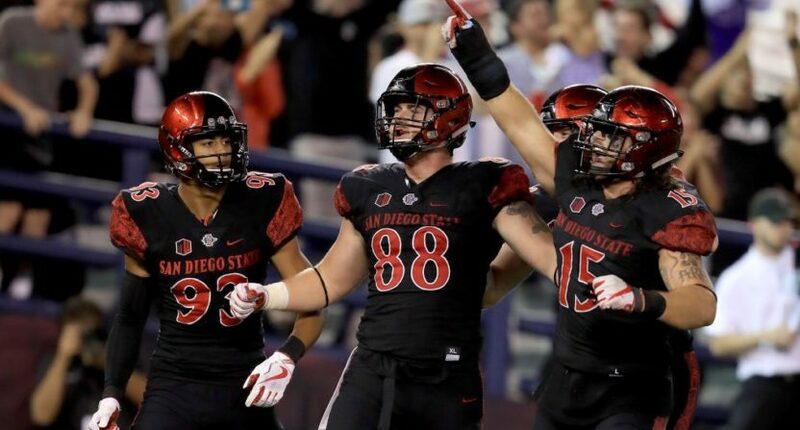 The Aztecs look like a team to be reckoned with this season. The Golden Bears parted ways with Sonny Dykes after four years and decided to pull the trigger on first-time head coach Justin Wilcox. After three games, that choice looks very smart. Cal started off with a come-from-behind win in Chapel Hill with Ross Bowers making his first start at quarterback. After a win against Weber State, the Bears hosted SEC foe Ole Miss. After falling behind 16-7, Cal scored 20 straight points including a pick six to ice the game. Cal was picked by many as the worst team in the Pac-12, but starting 3-0 has to feel good for their new head coach. The first two games the Commodores played weren’t against the best competition, so their cumulative victory of 70-6 had a cloud of mystery and doubt. Last week, they played Bill Snyder and always steady Kansas State Wildcats, handing the Wildcats a 14-7 loss. Vanderbilt currently has the top scoring defense in the SEC, allowing just 4.3 points per game. They also place first in total defense, allowing just 198.3 yards per game. It’s a small sample size, but the defense has been very impressive for Vanderbilt during the first quarter of this season. The reigning national champion shouldn’t be on this list. Or should they? Clemson lost the best quarterback that they’ve ever had in the history of their program, along with five other stars to the NFL Draft. The Tigers were expected to be good this year, but they were also expected to take time to establish themselves. They have found their rhythm early and often this season. Clemson beat Auburn in Week 2 and then trounced defending Heisman Trophy winner Lamar Jackson and Louisville last week. The Tigers are once again the front-runner to take the ACC crown and possibly more. The Bulldogs started off the season with two easy wins against lesser competition. They went into Saturday’s game against LSU as a 6.5-point underdog and had lost 16 of their last 17 to the Tigers. Many thought LSU would pull away in a relatively close game. What actually happened was the Bulldogs dominated LSU and cruised to an easy 37-7 trashing of the Tigers. Mississippi State has another big matchup with Georgia this week. Can this early-season success continue?